Rarely does anything even hinting at the label “philosophical” come close to being produced by a Hollywood studio, especially in the summer. 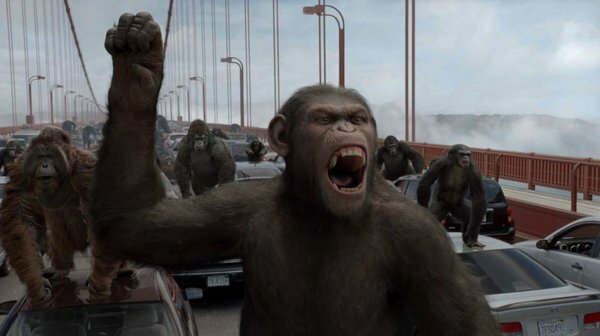 Rise of the Planet of the Apes is such a movie, though. More than half of it is spent meditating on the birth of free will and the nature of violence. This reboot is actually smart, and it’s propelled by a volcanic lead performance. I’m not talking about James Franco. He plays a fairly typical scientist motivated to cure a disease for personal reasons (his dad has Alzheimer’s). I’m referring to Andy Serkis, who breathes so much life into the role of the ape Caesar that it comes close to touching what he did in the Lord of the Rings films. He shows the true artistry of motion-capture acting. 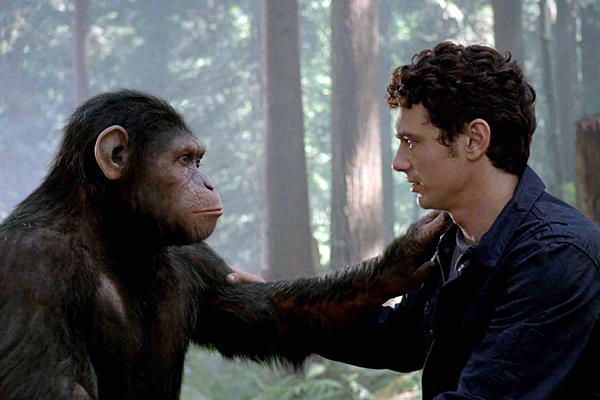 If Serkis is to be praised for his performance, the technical gurus behind these apes deserve accolades as well. Gone are the monkey suits of Tim Burton’s ill-fated 2001 reboot of this franchise. These are marvels of movie special effects. Of course, you expect a summer blockbuster to dazzle with its visuals. However, it’s something else entirely when it uses them to serve the story instead of pummeling an audience with mindless, trivial action sequences. This Apes reboot doubles as an origin story. The movie that first comes to mind is not any of the original Planet of the Apes films, but last summer’s Splice, only on a much larger scale. Like that film’s beautifully rendered monster, Caesar commands and holds the screen. We watch as he’s smuggled out of the research facility by Will (Franco) as a baby following the termination of the experiment his mother and several other apes were a part of. Like Splice’s Dren, he is raised in secret, though others eventually discover him. He is thrown into a monkey pound after he aggressively protects Charles (John Lithgow), Will’s dad, from a finger-pointing neighbor. The scenes of Caesar growing up and coming into himself are essential, but carried on a little too long. This uneven pacing doesn’t detract it from being almost constantly engaging, especially in the scene where he’s set free in the Redwood Forest to play. However, a love story featuring Will and a physician (Freida Pinto) who stitches up Caesar after he encounters an unfriendly neighbor, was clearly tacked on and underdeveloped. Director Rupert Wyatt thankfully doesn’t take a human perspective in this movie for long. We are submerged in Caesar’s world as he swings effortlessly through his house and trees. Will watches, but we get to actually experience it. Wyatt has wicked fun editing around trees, and uses them as frequent and effective set pieces for the bursts of action. Once Apes moves away from the science experiment phase and into a kind of ape prison scenario, it really begins to shine. Caesar learns the hard way about human cruelty, and the anger that burns in his eyes when he sees the cruel guard Dodge (Tom Felton) is menacing. Of course he is an outsider to the other apes at first, but he gradually wins them over. Without having the apes utter a single word, we’re shown how an army forms, and then revolts. This entire movie builds to an exhilarating climax: a battle sequence on the Golden Gate Bridge. It is so well edited that you will likely be replaying it in your head long after leaving the theater. Like 13 Assassins, another contender for best action film of the year, Rise of the Planet of the Apes shows up its thrill-seeking competition by first making us care, and then letting the spears fly. Burton’s redo of Planet of the Apes ended on a cliffhanger but was never given a sequel. This film also ends on an ambiguous note that leaves room for plenty more. The difference is, you actually want to see what happens next in this one. This entry was posted in Reviews and tagged Andy Serkis, Franchise reboots, Freida Pinto, Great franchise reboots, James Franco, John Lithgow, Planet of the Apes, Rise of the Planet of the Apes, Rupert Wyatt, San Francisco, Summer 2011, Summer 2011 movies by matterspamer. Bookmark the permalink. I thought it was pretty good. Judging by your review, I think I enjoyed it less than you, though.